A testing and painful ride, yet really good. This morning’s ride was interesting to say the least. I met up with the guys at around 8.40 and we headed up to Top of Leech. 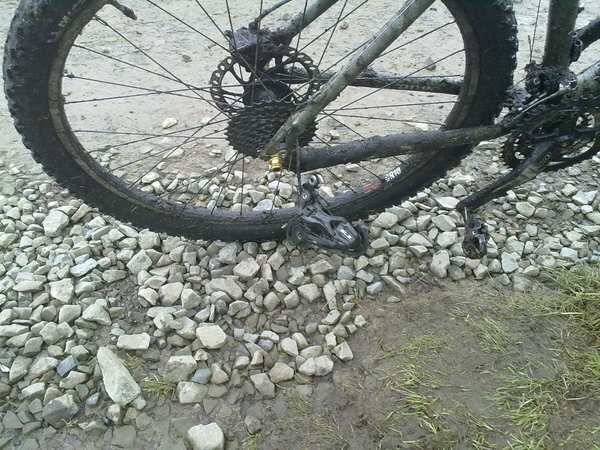 I’d fitted a new chain yesterday and it was suffering from a lot of slip. I removed a number of links on the way as I got it to how I wanted it. The plan was to drop down past Lee Quarry and into Whitworth, but time constraints meant that we ended up playing in Ding Quarry before a quick blast down the service roads of the Scout Moor wind farm and a cheeky drop down to the top Greenbooth Reservoir. There was still a lot of deep snow in the quarry, which resulted in me losing my balance and ending up in knee deep freezing water. The singletrack down to Lady Lees Wood was great fun. I then dropped my seat and we headed down the wood to the Reservoir..
My problem with descents is really improving, but the lack of grip meant that I had to get off the bike and push down a short stretch of the hill. 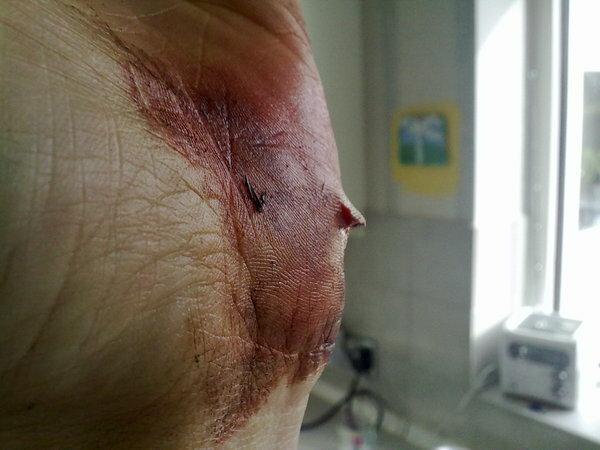 I slipped, wrapped my bike around a tree, slammed my hand down on the chain ring and punctured my hand. The rear hanger gave up about 2 miles from home. So I ended up pushing the bike back to Rooley Moor and then freewheeled home. I need to make sure I carry a first aid kit with me from now on as I can’t be trusted to ride without falling off. 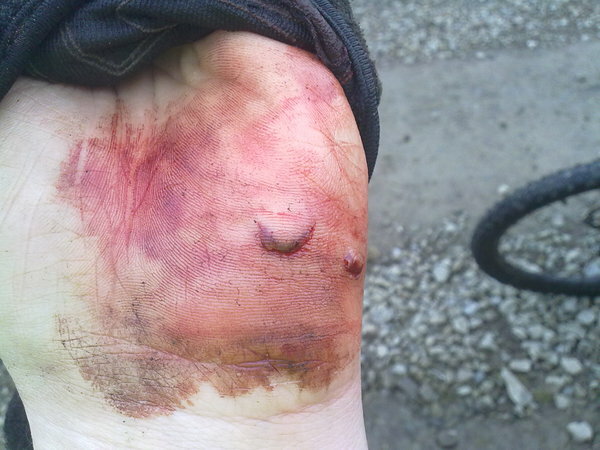 A great ride, but I’d have preferred to have not bled partway through! Last nights ride was meant to be a repeat of the loop over Ashworth Valley. I’d hoped that the more favourable conditions and my legs actually feeling attached would result in an improved time over the 1hr 9mins that I did at the start of the week. Shawfield Lane was very slippery,the high clay content made the surface testing to say the least. As I pedaled down past Norden Primary the rear mech locked up slightly, but a quick back pedal cleared it. Over Edenfield Road and onwards up past the back of Whittaker Moss the chain locked up again, as before a slight back pedal cleared it. As I cycled past the back of the school I lost drive and upon inspection I found that my chain was no longer connected to the bike. After a revisit of the route, I found it lying in a puddle. Great. A simple chain fix took 20 minutes, which was really frustrating, and I cycled home. Hopefully it should arrive at the same time as my new Time ATAC pedals. Last nights ride was quite enjoyable. I was aiming to go over to Edenfield and back, but decided that it might be a wee bit slippy on the tops. So, instead I ventured out over Shawfield Lane/Field/muddy track over to Norden, round the back of the old Library and up the hill to cross over Elmsfield and dropping down through Furbarn Lane before starting the climb up School Lane to Ashworth Valley Road. Then I got on to Ashworth Valley Road and my aim was to not stop until i’d got past the B&B. In reality I made it half way up the hill towards the old Edgerton Arms before my legs refused to work. A quick breather and off I went, there were quite a few patches of standing ice which made the climbing fun as it was tricky judging whether to sit or stand for the climbing. The climb up past the farm was easier than I previously remember, so fitness and endurance are improving. The top of Ashworth Road was covered in quite a lot of snow, from just after the farm to the start of the reservoir dam. Riding across the top was great fun as there was a very brisk side-wind that made cycling in a straight line difficult. Finished the ride by dropping down the road from Owd Betts to Norden and cycling home. I had the best intentions today to attempt a long ride (for me) . The plan was to get home at and go straight out for a ride up to the top of Rooley Moor and go past Ding quarry, down to Edenfield and back via Edenfield Road, Ashworth Road and a cut through the Naden Valley. What happened was that I had to pick my son up from where my wife was having her gym class, bring him home and then wait for my wife to get home and I had 70 minutes ride time remaining. So, off I went. I think the recent rides had lulled me into a false sense of security as the climb totally destroyed me tonight. I only stopped twice, but there was no energy in my legs for the climb. I got to the top in 30 minutes from my house and found that conditions weren’t great. It was a little too windy for my liking, so I turned the bike round and headed back down the hill and across to Greenbooth Res. I did find that I am managing to climb consistently well on asphalt surfaces, I just need to convert that to consistent climbs on the gravel. Again, tonight the surface was really claggy and it was like cycling through treacle. Overall disappointed, but this ride has moved me close to last years February mileage, so I’m still on track for a good month. 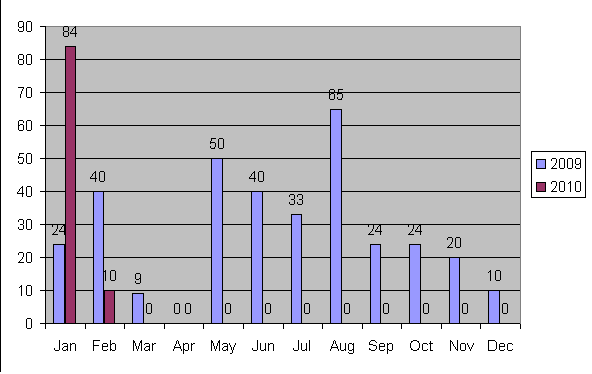 January has been unexpectedly good for my cycling. Despite an ice enforced break during the middle of the month i’ve ridden more miles than I did in any month last year, 60 more than last January and it has been really enjoyable. I’ve managed to climb where i’d have had to get off and push in the past. I HATE ice. I really really HATE ice. I don’t like riding over ice when using spds. I’m craving cycling.. I now want to ride whenever i’ve got spare time and my legs will let me. What has surprised me is how quickly i’ve got fit after the Christmas and New Year excess, rides that i’d expect to have taken over an hour have taken half of that and i’ve managed to carry on and ride for longer. So, 84 miles this month. I know this is quite insignificant compared to the mileage other riders put in, but for me it’s a major milestone and i’m looking forward to riding over 100 miles in February. 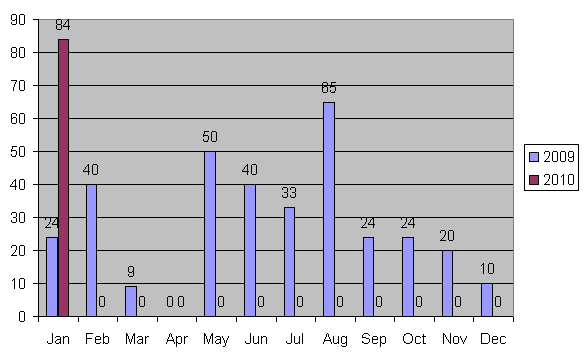 Interestingly January has seen me ride more than 3 times last January with only twice the rides.